Make sure to check out the instructional video below! ShopWildThings has long been interested in these fantastic lamps, but we have finally located a manufacturer with HIGH QUALITY polycarbonate pieces for these lamps. We've seen many cheap versions and they looked, well, cheap. The finished impression was not of rich colors and classy design. The lamps that we are carrying are of the highest quality materials. They are also eco-friendly. They are made from 100% recyclable energy saving, washable and heat resistant material. 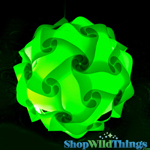 Jigsaw Lamps, Puzzle Lamps, Origami Lamps - are an amazing way to decorate your home, wedding, office, restaurant, retail space, wedding, party and more. They're great inside OR outside! 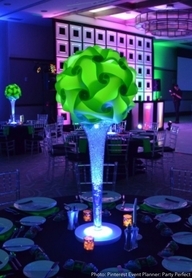 We offer these amazing lamps in 4 sizes. You can make many amazing shapes using the pieces included in your kit. The design is by Danish designer Holger Strom who won awards for his design back in 1972! Each light kit comes with 30 Polycarbonate pieces and full instructions to make over 20 different shapes. They are packed flat, which makes it easy to store them when not in use. The size for each extra extra large piece is 10". They are absolutely show stoppers! We offer a light kit, which is sold separately. Use LED or CFL bulbs under 40 watts. The Jigsaw lamp pieces are poly vinyl and heat resistant. Before the last piece is assembled take the long cord and put bulb down inside the lamp. Make sure the bulb is not touching the sides of the lamp. Take your final piece and bend it just a little and insert into place. Make sure the cord is dropped right down through a cluster of 3 of the straight pieces. It cinches the cord in place and holds the bulb in the center of the lamp. We are also pleased to offer a light bulb filter in a variety of colors. These filters come with enough material to cover 4 light bulbs. Just cut the filter (like a color gel) and wrap it around your bulb. Place the bulb in your lamp, and you can change the color of your lamp dramatically! Turn the white lamp into a yellow or dark blue lamp with just the change of the light bulb. Beyond that, you can also change the color of the bulb (use warm white or cool white bulbs).